BASED ON THE latest findings, Torah wisdom, and true stories, Dr. Shmuel Shields gives clear, user-friendly guidelines to be healthier, stronger, and more energized—and fulfill the mitzvah to “guard your health.” Meal plans, recipes, and practical takeaway tips make weight loss and healthy lifestyle changes a possible, achievable goal. Get the facts on fats—and why we can’t live without them. Find out why weight loss is all about portion and proportion. Boost your immunity and say good-bye to frequent colds and flu. Get the scoop on carbs—the bad and the good. Improve concentration by feeding your brain. Learn ways to cope with stress. Increase your energy and endurance levels. HOW HAPPY I was to see the manuscript of your book. The Torah obligates us to take care of our body where the soul resides. Hashem created the body to heal itself and provided food for proper nutrition. Your book provides an excellent means of assuring a healthy body for long life. At the same time, you fulfill the mitzvah of u’shemartem l’nafshoseichem—guard your health. My goodhearted wishes for much success in providing Klal Yisrael with this opportunity. MANY ARE GREATLY confused about what constitutes proper nutrition and healthy living. Having the privilege of working in the field of eating disorders for the past two decades, it was a great simcha when Dr. Shields presented me with his new manuscript, entitled L’chaim: Eighteen Chapters to Live By. It is a critical work for today’s times that will no doubt change the way we think of food and nutrition. The book is like a Shulchan Aruch of healthy living that is easy to refer to and presents its material in a straightforward and easy-to-understand manner, filled with information about the fundamentals of nutrition, diet, exercise, vitamins, stressors, etc. Dr. Shields bases his work on Torah and has put his heart and soul into sharing his considerable knowledge with the klal. L’chaim will surely be well received by the community, and it is my heartfelt hope that the valuable advice and formulas presented in this book will be implemented in homes and Torah institutions throughout the world. Reading this book is a part of the mitzvah of “v’nishmartem me’od l’nafshoseichem—you shall greatly beware for your souls” (Devarim 4:15). I wish the author much hatzlacha in this endeavor and in all of his efforts on behalf of the klal. May he be zoche to be counted among the matzdikei harabim shetzidkasam omedes la’ad. DR. SHMUEL SHIELDS was a talmid in our yeshivah, Yeshivas Kesser Torah, for many years. 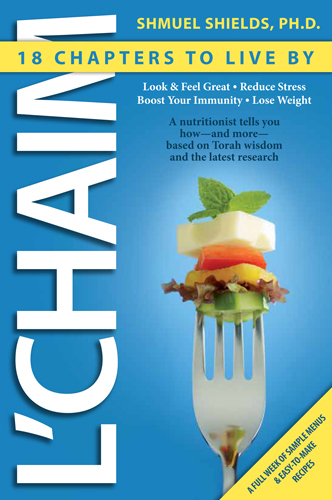 He is a nutritionist who wrote this book, L’Chaim: 18 Chapters to Live By, in order to help people eat healthy. He is a ben Torah as is evident throughout this whole book. May Dr. Shields succeed through this book in advising and enabling people to eat healthy and thereby be able to serve Hashem in the best possible manner. THANK YOU SO much for sharing your manuscript of the upcoming book, L’Chaim: 18 Chapters to Live By, with us. It is lively, clearly informative, easy reading, and spiritually inspirational as well! You inspire us, through positive eating and exercise, to be better servants of Hashem, to be more devoted to ourselves and our families—and you even offer motivation to improve our shalom bayis! We wish you and your readership long, healthy, successful lives! THE TORAH COMMANDS us, “V’nishmartem me’od l’nafshoseichem”—to vigilantly guard our health. A person who cares for the body which Hashem has granted him can utilize his strengths in Hashem’s service—to learn, to do mitzvos, and to sanctify the Name of Heaven in all that he does. I am pleased to bring to your attention the book, L’Chaim: 18 Chapters to Live By authored by Dr. Shmuel Shields, in which he presents ideas and methods by which one can maintain a healthy body and lifestyle. It is essential for both children and adults, and can optimize the days, months, and years which Hashem grants us on this earth. I trust you will find ideas and suggestions that can be helpful to you and your family members in maintaining and improving your health. BOOKS ON HEALTH and nutrition tend to make me feel guilty. About every six months I resolve anew to change my lifestyle. I buy a new book, along with plain nonfat yogurt and whole-spelt crackers from the grocery store, and promise myself that this time I’m going to see it through. I’ll end my relationship with pizza and sushi in favor of bright leafy greens, unsweetened fruit shakes and grilled chicken on half a whole wheat wrap. My most successful attempt lasted for four months, about two years ago. At this point I have almost an entire library of diet and nutrition books in my house. Yet Dr. Shmuel Shields’s book, L’Chaim: 18 Chapters to Live By, stands out among them. Dr. Shmuel Shields, a certified nutritionist with a private practice in New York, himself made the transition from what he calls a “standard American diet” (SAD): “about 150 pounds of sugar annually…and the amount of fat found in one stick of butter every day.” With the help of a local health food store proprietor, Dr. Shields discovered firsthand the benefits of a healthy lifestyle. He experimented with a range of eating habits, including a foray into veganism, before settling on a “high-fiber, primarily plant-based diet” that includes chicken or meat on Shabbos. Now he uses his knowledge and experience to help other people. In addition to his practice, Dr. Shields is also a popular lecturer and health columnist. The book is organized into eighteen distinct chapters, and each chapter focuses on one aspect of living a healthier lifestyle. Dr. Shields explains it fully using a blend of current scientific findings, Torah perspectives, and tips for practically incorporating it into our lives. The nutritional information is cleverly interspersed with personal anecdotes from both Dr. Shields’s life and practice—showing how people have successfully integrated these changes into their own lifestyle. The topics include ways to boost your immunity and avoid colds and flu; how to distinguish between “good” carbs and “bad” carbs; the role of fat in our diet (it’s not as bad for you as you might think); how to wean ourselves off sodas and other artificially sweetened drinks with the only beverage your body really needs: water; debunking the most common excuses for why we don’t exercise and feasible ways to increase daily activity; stress reduction, especially in an age of increasing reliance on technology; and sleep—why it’s so essential for both physical and mental health. Each chapter ends with a practical application for the concepts it covers, including meal plans, original recipes, strategies for staying on track on Shabbos and yom tov, tips on longevity from a woman who passed her 100th birthday and, most importantly, healthy alternatives for some of the most unhealthy foods we love to eat, like pizza and hot dogs. Many readers will find chapter 17, “Transitions: Step by Step,” to be particularly helpful and hopeful. This chapter acknowledges the difficulty of changing our habits and routines and recommends a slow but steady process to make it stick. There are even useful tips for getting used to new tastes and foods, like mixing small amount of unfamiliar foods with familiar ones. L’Chaim: 18 Chapters to Live By may be the solution that so many of us, who would like to be healthier but are not quite sure how to go about it, are looking for. It’s easy to read and strikingly concrete and of-the-moment. With the integration of Jewish life into the core of its premise, this book fills the unique niche of the observant, kosher consumer. It’s a book that has given me a lot to think about and one I certainly plan to refer back to as I attempt, once again, to commit to a healthier lifestyle for myself and my family. SHMUEL SHIELDS, PH.D., is a certified nutritionist with over twenty years of clinical experience. Dr. Shields is a corporate trainer and New York University faculty member. He began his advanced learning at Yeshivas Kesser Torah in Queens, New York, and currently lectures on health-related topics to numerous Jewish organizations, including Agudah Women, Young Israel of Great Neck’s Project Identity, Emunah Women, Jewish Association for Services for the Aged, and Jewish Board of Family and Children’s Services. His lectures may be viewed on www.torahanytime.com. He developed the exclusive vitamin-mineral supplement, VitaShield Advanced Formula with Extra Vitamin D, after extensive research. For more information, visit his website, www.drshieldsnutrition.com, or contact him at rmshields62@verizon.net. ARYEH HAD ALWAYS felt grateful for the countless blessings in his life: his family, friends, job, neighborhood. But after spending a night in the emergency room with frightening chest pains, he realized that he truly couldn’t take anything for granted—including his health. He was relieved when the diagnosis turned out to be indigestion, but he viewed it as a wakeup call. Aryeh began to curb his great appetite—especially for red meat—and to eat healthier, more balanced meals. Months later, looking back at this alarming episode, Aryeh was able to recognize that it was a blessing in disguise—one that propelled him to finally make the lifestyle changes necessary for ongoing health. WHAT IS A BALANCED MEAL? Whether you prefer home-cooked meals, takeout food, or restaurant dining, the basic components of a balanced meal are the same no matter how you slice it…or, to be more precise, no matter what type of foods you eat. If you were to ask a group of nutrition experts to define a “balanced meal,” odds are you’d receive many different responses. Still, you’ll likely discover one common approach: the importance of including the four basic food groups—proteins, carbohydrates, fats, and vegetables and fruits—in your daily diet. But it would be folly to put too much emphasis on the importance of these four food groups without an understanding of the concepts of proportions and whole foods (see chapter 1, “Whole Foods: A First Step in Holiness”). Let’s say you go to your favorite fast-food restaurant and order a jumbo burger on a bun with a thin slice of lettuce and fries on the side. Would you consider this a balanced meal? If you’re strictly accounting for the four basic food groups, then you’ve certainly met the criteria: the burger contains a jumbo dose of protein, there are plenty of carbohydrates in the bun and fries, no doubt fats and oils abound (just check your napkin), and that green slice of lettuce counts as a vegetable. But if you’re aiming for healthy choices and proportions, this meal is truly out of balance! Let’s backtrack to some basic facts about human biology. Living organisms can be divided into three categories based on the types of foods they mainly consume. Herbivores eat plants, carnivores eat animals, and omnivores eat both plants and animals. In His infinite wisdom, Hashem created members of each group with precisely the type of anatomy (organ structures) and physiology (organ functions) best suited to their digestive needs. For example, a lion is classified as a carnivore—a meat eater. The lion’s anatomy and physiology are designed to be most efficient for meat consumption. A lion’s saliva is acidic, which begins the breakdown of animal protein in its mouth. The intestinal tract is short, allowing for quicker processing of meat. The liver and kidneys are large to best handle the metabolic byproducts of animal protein digestion. And it has sharp fangs and claws that are most suited for consuming flesh. In contrast, the digestive tracts of herbivores are long, since it takes a long time to absorb nutrients from the plant material they eat. They also have many molars that facilitate the grinding of plant-based foods. In addition, an herbivore has a large caecum (first part of the large intestine) which, together with enzymes, helps break down plant material and cellulose. Similarly, an omnivore, which eats both plants and animals, is built with a digestive system that is most suited for a predominantly plant-based diet. A human being is one example of an omnivore. Human saliva is alkaline, which initiates the breakdown of plant-based, starchy foods in the mouth. Human teeth are best suited for chewing and grinding grains and other plant foods. The smaller liver and kidneys limit a human being’s capacity to handle metabolic byproducts from large amounts of animal protein. And the digestive tract is long to ensure digestion and absorption of plant-based rather than animal foods. Is it any wonder that eating too much red meat often leaves us feeling bloated and even sick? Of course, this doesn’t mean that we shouldn’t eat any animal protein. But portions and frequency should be limited. We should be relegating proteins to a side dish rather than eating them as our main dish at meals. Mrs. B. was an energetic balebusta, busy juggling family and work responsibilities, often at a frenetic pace. Unexpectedly, when her son Avi turned three, he developed into a dramatically fussy eater—to the point that his diet consisted mostly of white bread and jelly sandwiches. Mealtime was now an ongoing power struggle. What could she do to reverse this turnaround? After consulting with Avi’s pediatrician about basic food guidelines for preschoolers, Mrs. B. attacked a stack of child-nutrition books at her local library. That night, Mrs. B. initiated a new approach to Avi’s eating habits. Over time, with repeated exposure to a variety of healthier foods, Mrs. B. was delighted to see Avi’s growing compliance and even enthusiasm at mealtime. A busy balebusta is constantly faced with the challenge of designing meals that please her family’s taste buds and keep everyone healthy at the same time. The key is to prepare foods that are both tasty and nutrient-rich and to make sure they are served in properly balanced proportions. Ideally, each lunch and dinner meal should consist of a hearty serving of vegetables (cooked, raw, or both), together with smaller amounts of healthy carbohydrates and proteins. What is considered a balanced proportion? Imagine your plate divided in half. Fill one half of it with vegetables. Half of the plate’s other half should contain unprocessed, whole carbohydrates. These include brown rice, sweet potato, corn, whole-wheat pasta, whole-spelt pasta, whole-wheat bread, or buckwheat (kasha). Finally, fill the remaining quarter of your plate with lean protein foods, such as fish, lean white-meat chicken or turkey, an egg, or low-fat cheese. Proteins don’t just come in the form of animal products. Plant proteins are nutritious alternatives to animal proteins. Chickpeas, beans (such as lima beans, kidney beans, or pinto beans), soy protein (soybeans, tofu, or tempeh), and legumes (peas, peanuts, or lentils) are examples of these. As a general rule, serving sizes of animal proteins should be no more than three ounces, or the equivalent of half a cup of plant protein, such as beans or lentils. What about fats and oils? Although small amounts are essential for optimal health, they should be eaten sparingly because of their high caloric value. And the truth is, all natural whole foods contain varying amounts of fats. With a varied diet, you can meet your needs for this food group from eating healthy foods alone. Raw, unsalted nuts and seeds are excellent food sources of dietary fat. Just make sure to eat them in moderation. When planning a meal that includes more than one course, consider starting with soup or a salad. These high-fiber foods will satiate you from the onset and keep you from overeating. A hearty salad might consist of a variety of colorful vegetables, including leafy greens (such as lettuce, kale, or collard greens), red and yellow peppers, tomatoes, cucumbers, and carrots. Use salad dressings sparingly. Avoid salads prepared with mayonnaise; instead, squeeze fresh lemon over salads as an all-purpose flavor enhancer. Fresh lemon can also be combined with olive oil and herbs to make a dressing. A wholesome soup can boost the nutritional value of any meal. Their liquid state makes soups easy to digest and absorb. A nutritious soup made from beans, lentils, or peas provides you with valuable fiber, protein, and carbohydrates. Vegetable and fruit soups are rich in essential nutrients as well. Chilled beet borscht or clear broth are also good choices. When it comes to dessert, your best choice is to skip it if you’re already full—or follow the Mediterranean Diet approach. This refers to the traditional eating patterns of the countries that border the Mediterranean Sea (see also chapter 11, “Wrapping Up the Week”). In terms of desserts, healthy options eaten in these countries include fruit compote, dried fruit, baked apple, a whole-grain sweet biscuit (similar to a graham cracker), a homemade oatmeal cookie, a whole-grain muffin, or a piece of dark chocolate. A small serving of nuts serves as another wholesome dessert choice. Almonds, hazelnuts, cashews, and walnuts are a few tasty varieties.